Tropical trees are generally long-lived making it difficult to assess the long-term effects of habitat fragmentation on genetic diversity. Maintenance of genetic diversity in fragmented landscapes is largely dependent on the species’ mating system and the degree of genetic connectivity (seed and pollen flow) among fragments. Currently, these parameters are largely unknown for many endangered tropical tree species. Additionally, landscape fragmentation may isolate tropical tree populations from larger, more continuous populations. The role of isolated individuals in pollen transfer within and between remnant populations is not clear. In this study, we estimate the mating system and pollen flow patterns in continuous and remnant populations of the endangered tropical tree Guaiacum sanctum (Zygophyllaceae). Fractional paternity analyses were used to estimate average gene flow distances between fragmented remnant populations and the siring success of an intermediately located, but isolated individual. In these populations, G. sanctum is a mixed-mating species (t m = 0.72 − 0.95) whose pollen is transported over large distances (>4 km). An isolated tree may have functioned as a stepping-stone between two clusters of individuals, assisting long-distance pollen movement. This individual also sired a disproportionately high number of seeds (13.9%), and is thus an important component of the reproductive success of these populations, thus rejecting Janzen’s “living-dead” hypothesis. The high levels of genetic diversity maintained as a consequence of long-distance pollen-flow suggest that this endangered species may have the potential for future adaptation and population expansion if suitable habitats become available. 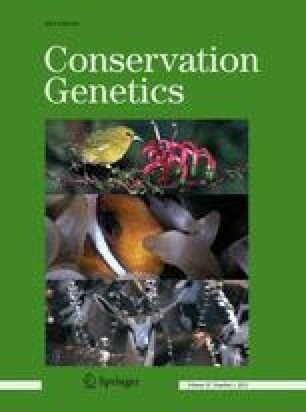 The authors would like to thank T. Robles; R. Blanco and M. Chavarria from Área de Conservación Guanacaste (ACG); C. Alvarado and U. Chavarría from ACAT; C. Deen, and D. Trapnell for technical assistance. J Ross-Ibarra and M Poelchau and two anonymous reviewers provided valuable comments on earlier versions of this manuscript. This work was supported by Idea Wild; Universidad de Costa Rica (Vicerrectoría de Investigación) and Organization for Tropical Studies [to E.J.F.] and National Science Foundation [0211526 to J.L.H. ].